Working at any building site is pretty hard as it is. Made worse if one has to contend with uneven, or wet ground, to collect dirt or move other bulk material is not only backbreaking work, but fraught with OH&S traps. Using a wheelbarrow just won’t cut it. Made in Salerno, Italy, Cormidi range of tracked mini dumpers or carriers from Aztex Equipment is just the ticket for this type of work. (Aztex Equipment is a local dealer for Cormidi mini dumpers). The use of rubber tracks gives this unit excellent traction in all weather and terrain. Cormidi’s proprietary sprockets provide superior traction compared to tyres and non-track machinery like skid steer loaders. Wet and muddy surfaces are not a problem, as the tracked carrier only has a ground pressure of around 3.75 psi (0.179 kPa), compared to the 10 psi (0.478 kPa) exerted by the average person. 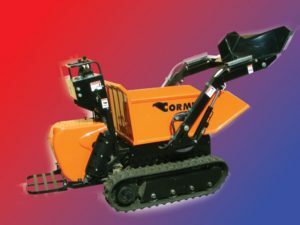 With its big load capacity and use of the self-loading bucket, A Cormidi mini dumper is better at moving dirt and other bulk material when compared with skid steer loaders or mini loaders, with their capacity limited to the size of the bucket. Cormidi tracked mini dumpers come in several models: Cormidi 50, Cormidi 65, Cormidi 80, Cormidi 100. These units start from 700 mm width to 950 mm for the largest unit, the Cormidi 100. The latter unit is able to carry load of up to 1000 kg. There are many advantages to Cormidi dumpers. 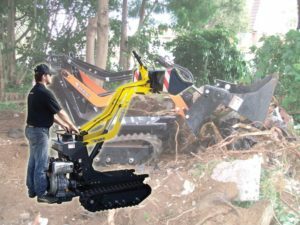 For instance, there’s the ability of being fitted with optional attachments like an auger, trencher and mixer—to extend the unit’s flexibility in construction, landscaping, or agricultural use. The Cormidi 50 and the Rikishi 7.0 are narrow enough to be able to go through a standard width doorway of 700 mm. And on the latter unit (Rikishi 7.0), this is an unusual model in the Cormidi range that looks different from the other models. With an arm mounted directly on the frame, this mini transporter is a nimble mini loader. Highly functional and reliable, this unit is ideal for all types of carting and tipping work. Just like the other models in the range, this transporter has sturdy undercarriage, rocking rollers and rubber tracks to allow it to work on all ground surfaces. Features include hydrostatic transmission, with three pumps, and simple controls, to make this unit easy to operate. Another feature of Cormidi dumpers is the ability to tip material in large dumpers. Take the Cormidi 80, for instance. Being a high tip unit, the Cormodi 80 is able to dump its load of up to 800 kg easily into standard skip of 1.3 m high, with its 1450 mm high pivot. Where required, Cormidi long-life undercarriage can be fitted with steel rocking rollers to improve traction on uneven ground, as well as a two-speed transmission, which provides a travel speed of up to 6.0 km/h. Cormidi units can be supplied with either a Subaru petrol engine or a diesel engine. The upper structure of the unit is built from high-quality Swedish steel.